Hardcover: Yale University Press, 2011. 2011 is the 400th anniversary of the publication of the Authorized King James Version of the Bible. Its importance to the development of English language and literature can hardly be overstated, and in The Shadow a Great Rock, Harold Bloom brings his formidable knowledge to an understanding of its literary richness. 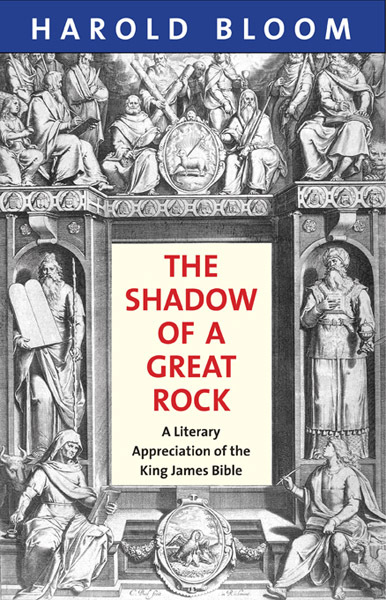 Bloom sees the King James Bible standing alone with Shakespeare at "the sublime summit of literature in English." He calls it an "inexplicable wonder" that a group of writers could bring forth such a magnificent work of literature, and credits William Tyndale as their fountainhead. Reading the King James Bible alongside Tyndale's Bible, the Geneva Bible, and the original Hebrew and Greek texts, he highlights how the translators and editors improved upon—or diminished—the earlier versions. This is another exciting foray into Biblical studies by the author of The Book of J, Jesus and Yahweh, Fallen Angels, and The American Religion.